Astronomers and physicists have come to understand that comets zip around our solar system following orbits—orbits that are shaped by the gravitational fields of the planets and the sun. The sun, being the most massive object in our solar system, has the greatest influence on the comet's orbit—but each planet that the comet passes also pulls and twists its path. 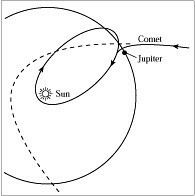 The makeup of the comet, its origins, and the time at which it was created, all affect the orbit as well. Using this as a marketing metaphor, let’s compare Consumers to comets, traveling through their own personal solar systems. Instead of planets and stars, we have Need States—which continually pull on the Consumers’ orbits—changing them drastically, or subtly, depending on their current arrangement and relationship to each other. Consumer research identifies patterns in the population. Segmentation identifies demographic and attitudinal patterns. Exploratory qualitative and quantitative research identify behavioral patterns. Shopper research finds patterns in peoples’ decision making and purchase activity. But the ultimate goal of consumer research shouldn’t be about mere pattern recognition. It should be about gaining insights that your company can actually use to make the right decisions about where to go next. What the methods listed above fail to deliver is specific detail about individuals—details that can provide that spark of inspiration, or sense of empathy, that leads to developing products and communications that truly resonate with your consumers. Stories are powerful. In many ways more powerful than reams of numbers and broad articulation of collective experiences. That’s why spending time talking to individual consumers has real merit—because stories are powerful. In many ways more powerful than reams of numbers and broad articulation of collective experiences. Collectively, there is value in the myriad sources of information available to marketers today. But when the people responsible for creating new products are set to task, they really need a way to connect to the consumer’s experience—in the moment they will be using the product. For our purposes, we’ll use the term “Need States” to describe the situations and factors that drive—or influence—consumer behavior. Depending on the industry, and its priorities, these can include functional, emotional, social, and even temporal factors. They usually apply to consumers with certain demographic and psychographic specifications—but some are broad enough to apply to multiple consumer segments. Ultimately, Need States help companies focus their efforts, creating real value for their target consumer. Think back again to the comet barreling through the solar system. Each planet or star the comet swings by changes its orbit a certain amount. The effect on the orbit is determined by the properties of the planet/star, such as its mass and proximity, relative to the comet. Closer, more massive objects will in turn have a larger effect on the comet. Like the planets affect the comet, every Need State a consumer experiences influences their behavior in some way. Need States exert a sort of gravitational force over the consumer, each one tugging the consumer’s path in one direction or another. The properties that determine the magnitude of the effect here are emotional valence, temporal cost, and perceived importance. As consumers continue to move through their own personal orbits, the differing Need States they encounter not only shape their purchasing/product usage—but their moods, attitudes, and future behavior as well. She is a 35 year old married woman with 2 young children. She is an artist and a teacher. She tries to spend time with her extended family when she can. Weekend Socializer: Rebecca is a very social person, and loves to plan parties and get-togethers. But she wishes she had more time to keep in touch with her longtime friends. Dinner Rush: Family meals are important to Rebecca, and the evening meal is her best chance at getting everyone together—but she wishes she was more creative in the kitchen. Intergalactic experiment #1: Using this information, come up with two new product ideas. One to help Rebecca get more creative in the kitchen, and one to help her connect with old friends in a new way. Now, we're going to send a satellite probe to collect some samples. Our mission yields two short videos in which Rebecca tells a story about her attempts to keep up with old friends, and about having creativity in the kitchen. Intergalactic experiment #2: Using all of the information you now have, come up with two new product ideas: One to help Rebecca get more creative in the kitchen, and one to help her connect with old friends in a new way. See how simply listening to a story helps the idea generation process? People connect to personal stories more quickly than mere descriptions of situations or feelings. This connection through Consumer Immersion can spark real creativity—and make the resulting ideas more relevant to actual humans and their needs. Consumer Immersion is about taking the time to connect to an individual consumer; listen to their stories; understand their experience by participating in it. If the goal is innovation, Consumer Immersion draws inspiration from actual situations, emotions and memories. If the goal is communications, Consumer Immersion provides empathy for the consumers' experiences based on actual events in their lives—along with real language that can help your message truly connect to people. Plus, immersion work is way more stimulating than wading through official descriptions of numerous Need States—which also tend to be somewhat generic in order to apply to a large population of people. Consumer Immersion should take place after Segmentation and Need State Identification. At this point, the opportunities have been identified and validated—so the point of Consumer Immersion is connection with the people who experience the Need States, not confirmation. Be open to variation from the “Ideal Consumer.” The orbits that are mapped out by large-scale consumer research often represent a simplified ideal consumer. Consumers as individuals rarely display all of the traits predicted by research. These differences will surface during Consumer Immersion, and should be considered opportunities—rather than dismissed as irrelevant. Consumer Immersion is about interaction, not interviews. The bulk of the session should be experiential—with both the clients and consumers working together towards a goal. Sessions that allow for the client and consumer to experience a Need State together can be powerful. Many of the best sessions I’ve seen begin with placing the client and consumer in a situation together for a time—followed by a working session to generate new product or communications ideas. Connect through communication. The majority of consumer research is one way—the consumer provides information, and the client absorbs and processes it. Personal connection is the point of Consumer Immersion, so the process should be designed to promote two-way communication. One way to help is to encourage the members of the client team to jump in and share their personal experiences with the consumer too. Mapping out Need States, cataloging consumers, creating a model that describes how they interact, and predicting how they will (probably) behave in the future is an important task. This information is vital when planning out a business or brand—and creating strategies. But it is equally vital to go out and collect the living samples that can connect the big picture data to the actual objects in the overall system. Consumer Immersion can help the people in your organization understand how Need States manifest in the lives of real people. Data may provide some focus and validation, but stories help people connect to the insights within the data, and provide the inspiration necessary for real innovation. Ready to dive into the hearts and minds of your consumers? Click below to find out how with our Consumer Immersion projects. ©2019 Ideas To Go, Inc. All rights reserved.